The Gray Wolf, or commonly known as the Timber Wolf, is a coveted species that broadly inhabits many of our northern and southern landscapes. Frequently observed during various big game seasons, this apex predator offers an extremely desirable hunting opportunity that is often described as the “ultimate” experience. Their exceptional intelligence and elusive character naturally defines their challenging quest, making them unquestionably, one of the most difficult animals to successfully pursue. Strong populations and probable harvests, with a range of highly prized color phases, have distinguished Manitoba as a popular destination for the wolf hunting enthusiast. Perched among the standing timber, you glass the limits of a lengthy cut line. A maze of trails with freshly marked tracks remind you of its ghostly presence. You sit and wait for hours upon days, through unforgiving elements that insistently take their toll. Demanding of your stamina and patience like nothing before. Your eyes become deceitful from the constant stare. But hope prevails, your commitment stays true. You’re suddenly alarmed from an overwhelming sense, something is watching. As you inch to your left, motion is spotted. Black as night, it edges the treeline. Your emotions run wild as you make the next move. The relentless pursuit has come to fruition! 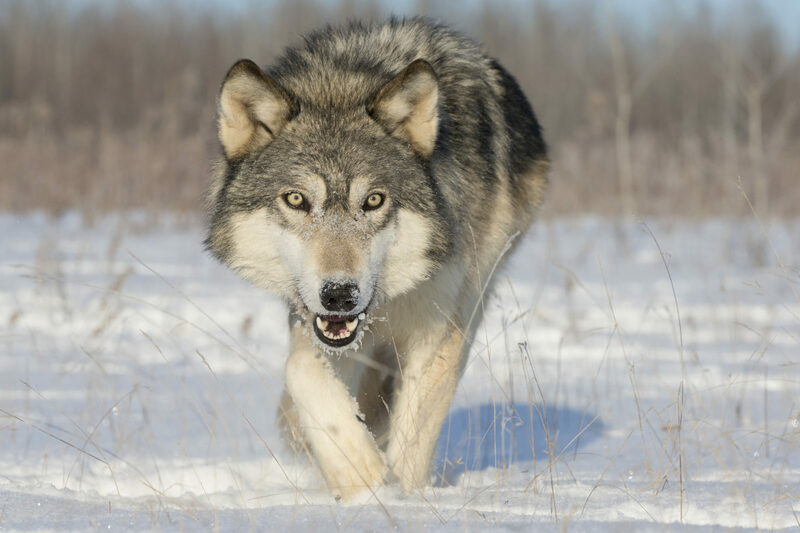 Wolf hunts are popular in areas of the Northern, Parkland, Interlake and Eastern Region. Hunting season dates are during the months of August through March. With abundant and widespread populations amongst Manitoba’s southern regions, the coyote has progressed into a prevalent hunting opportunity that is consistently attainable throughout the fall and winter season. Having a strong instinct for survival, curious demeanor and willingness to investigate a broadcast of distress, the coyote grants an appealing challenge that is commonly met with a successful encounter. Manitoba’s vast agricultural tracts and forest fringes are prime habitats for this remarkably popular predator. All of which extend favourable access to an exceptional coyote experience. Hunkering behind a screen of unassuming cover, you unleash a torrent of convincing cries that rebounds off a forward tree line. A wandering coyote is promptly enticed. The reaction is instant, the advance is rapid. Your focus is firm as it cautiously flanks your hidden location. You prepare your sights as it closes the distance. Your heart beat races, your body trembles. It saunters across an open meadow, curiously searching for its struggling prey. Merely yards ahead it stops in its tracks, as it senses an unknown presence. Your patience has trumped a cunning ability! Coyote hunts are popular in areas of the Parkland, Western, Central Plains Pembina, Interlake and Eastern Region. Hunting season dates are during the months of August through February. For more information on Game Hunting Areas (GHA’s), season dates, resident, non-resident & foreign resident hunting licenses or additional information on hunting in Manitoba, please visit the Manitoba Conservation website or refer to the current Manitoba Hunting Guide.